The ABC Position report was released on July 12, showing June shipments at 174 million lbs., up 15% over June 2015. Since March, California almond shipments are 17.6% above last year. Shipments since January are tracking 8% up over prior year. Prices coming off the historical highs of last summer have stimulated strong increased demand across export markets. Consumers in the U.S. are beginning to see retail prices reflect the price declines that began last September. U.S. Shipments will begin increasing as lower retail prices and increased promotional efforts appear in the next few months. 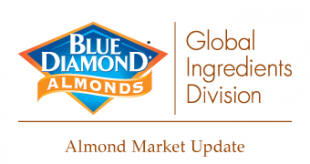 2015 crop inventory will end at 420 – 430 million lbs., as July shipments should again exceed prior year shipments. From July to December last year, shipments were historically light. 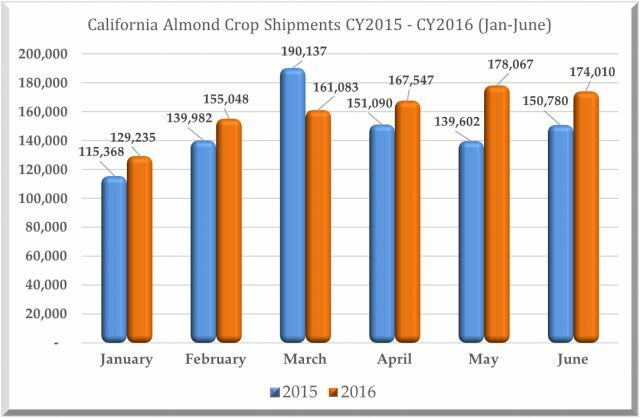 2016 crop shipments, at current prices, will significantly exceed the 2015 crop shipments through December. With a 2016 crop of just over 2 billion lbs., supply and demand will achieve a balance and stability not seen in the past two years. Less volatile pricing shifts are likely to create a more stable environment that fosters demand and increased consumption.